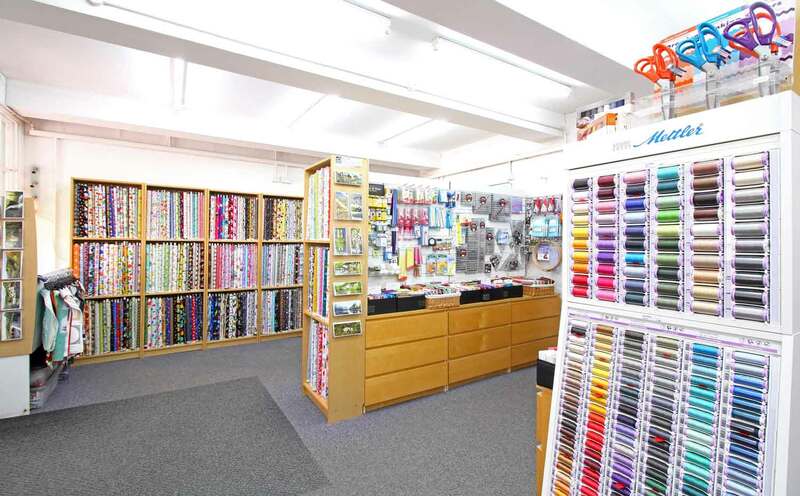 Quiltessential is a specialist fabric shop, which sells materials and equipment for patchwork and quilting. Although we sell a lot of our products online, we are a proper shop where you can come and look at the fabrics, feel the quality and lay them out, side by side, to see how they look. We have good quality lighting to display our fabrics and are happy to help you choose if you are unsure. 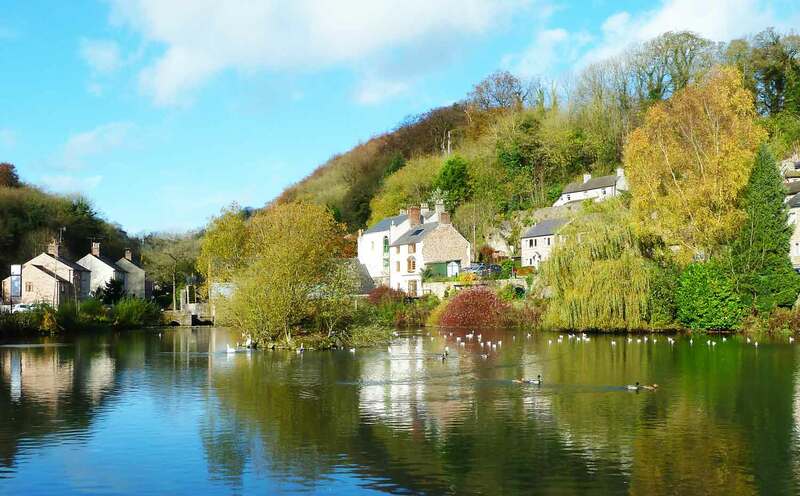 Our shop is located in the beautiful Derwent Valley in the heart of Derbyshire. 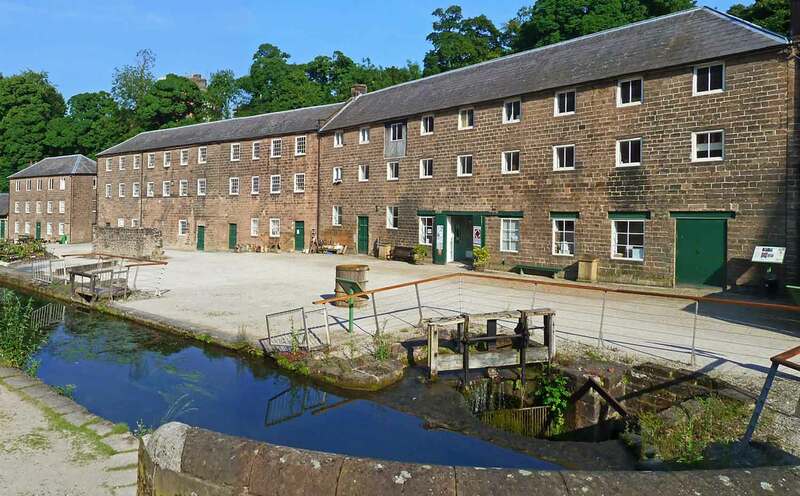 We are within the mill yard of the historic Sir Richard Arkwright's	Cromford Mills complex in Cromford, which is a Grade 1 listed building and a UNESCO World Heritage Site. We sell a wide range of quality, 100% cotton fabrics for making patchwork quilts, dressmaking and other textile crafts. We also sell wadding (batting), notions and equipment including: rulers, templates, rotary cutters and cutting mats plus buttons, bag making accessories, patterns and a variety of sewing threads from Mettler and Madeira. During periods of snow please check our website for information or phone the shop to check that we are open. 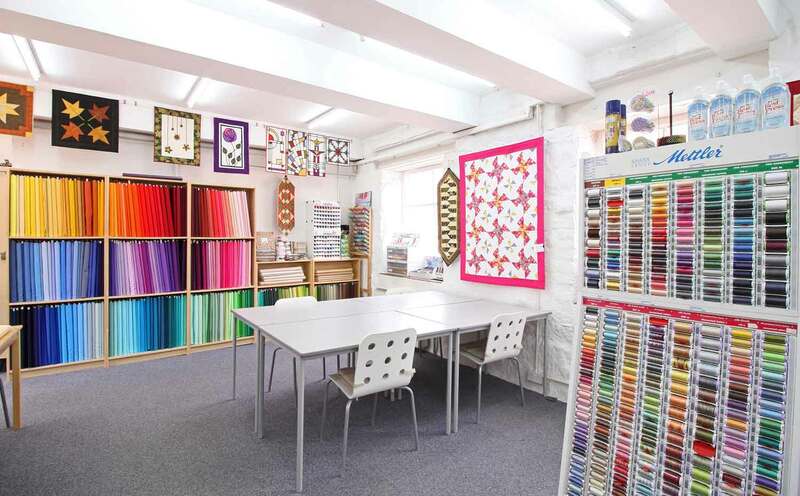 The shop at Cromford Mill was opened by Ann Mayner in 2005 and since then the business has grown to become one of the largest specialist patchwork and quilting shops in the Midlands. 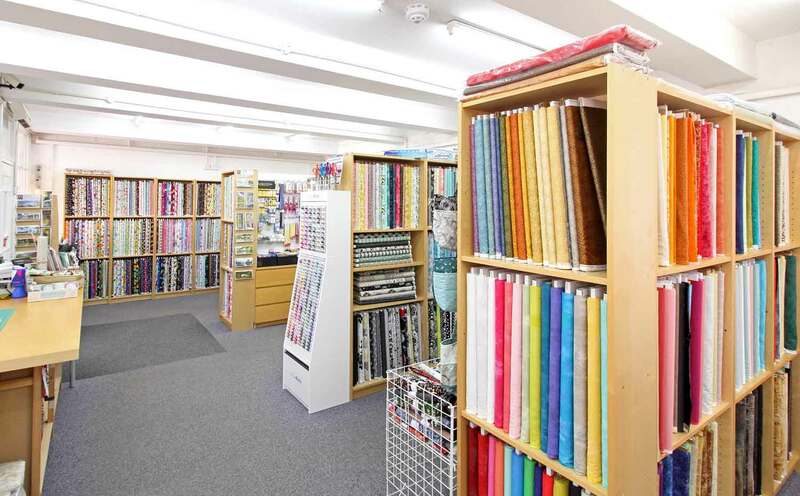 The shop stocks a wider selection of craft weight cotton fabrics than most John Lewis stores. Ann and her staff have a reputation for providing a friendly and helpful service and they are always happy to help customers choose fabrics for their projects. Ann has a wealth of sewing related technical knowledge gained over many years and teaches classes in the dedicated workshop space within the shop. There are regular classes with projects suitable for various skill levels from beginner to advanced. Ann also teaches a one-day beginners classes for the absolute novice once a month. 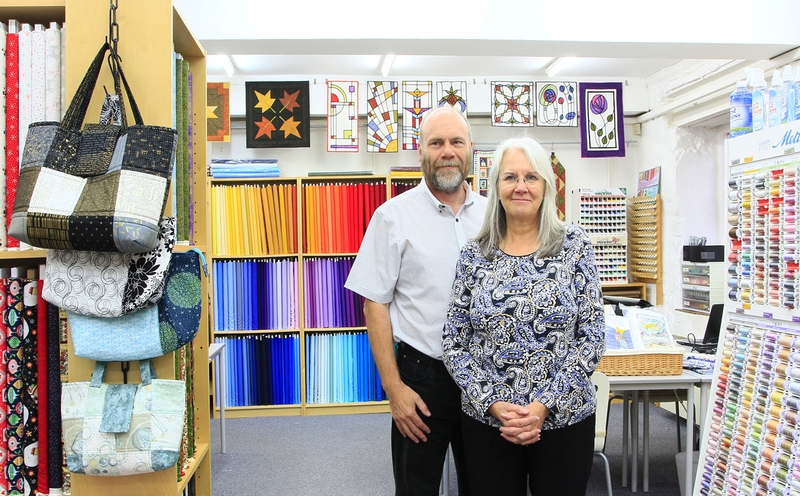 Ann and her husband Darren, who is an architect by profession, design quilt and bag patterns, which are sold exclusively in the shop. Each pattern is clearly illustrated with scale diagrams and comprehensive instructions and most of them also feature in the shop’s busy and popular workshop schedule. Our workshops are normally a full day class. We also run a one day beginners class. These normally take place once a month on a Saturday. We provide all the equipment and materials and teach you how to accurately cut fabric and how to use a sewing mchine to make a patchwork cushion. Our patchwork and quilting fabrics are carefully selected, high thread count, finely woven cotton from leading manufacturers and are generally 44 inches (112cm) wide. They are craft weight and suitable for dressmaking or soft furnishings but not suitable for upholstery or curtains. We sell a wide variety of colours and designs from plains through to exquisitely patterned and colourful Japanese fabrics. We stock bright modern prints and traditional or reproduction designs, batiks and a variety of blenders. We probably have the largest range of children's and novelty fabric in the UK, most of which are available through this website. We are one of a small number of UK retailers which stocks the full range of 343 Kona Cotton Solids plain coloured fabrics. In our opinion, these are the best plain fabrics available in the UK. 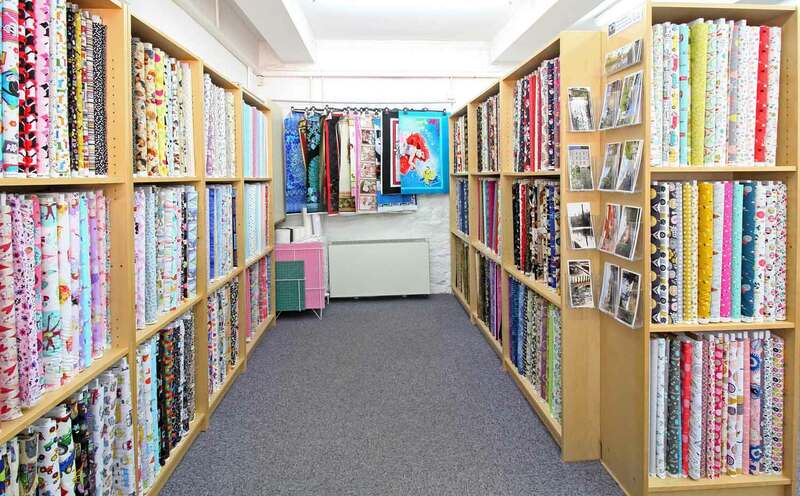 There are approximately 1500 fabrics listed on this website but we have over 2000 in the shop. Some, like the white-on-white fabrics are impossible to photograph. In accordance with UK and EU law we have to sell fabric in metres or fractions thereof so all our fat quarters are 50cm (19.5 inches) x half the fabric width (normally 56cm or 22 inches). This means they are larger than fat quarters sold in the USA.